Home End Times The AI "Image of the Beast"
Home / End Times / The AI "Image of the Beast"
In today's society, most of us regularly talk to Alexa, Siri or Google Assistant or even the artificial intelligence embedded in our cars, refrigerator, or our home. The AI talks back and responds directly to us about whatever it was that we wanted to know from it or to do for us. Without even realizing it, human daily interaction with AI has become very common, and is continuing to grow more common. Scientists and others who predict what the future holds (futurists) have even planned, for the future, to name this artificial intelligence (AI), “Singularity.”, when it is no longer just the product of man, but has complete control over itself. AI and the "Image of the Beast"
Added to the description of the Image having “breath,” (Rev 13:15) gives us the impression that it is some kind of self-operating machine, a computer-operated cybernetic robot, programmed so that it can speak and act like it’s alive and command the worship of the world. Artificial intelligence and robotics are advancing so rapidly today, making this prophecy no longer futuristic. Imagine how far fetched this would have sounded in John’s day. Robots are increasingly replacing human functions by automating manual tasks. Killer robots, digital doctors, and driverless cars are just a few examples of how far technology has gone in taking over our lives and replacing human effort. Science is racing towards giving life to an “image” already. 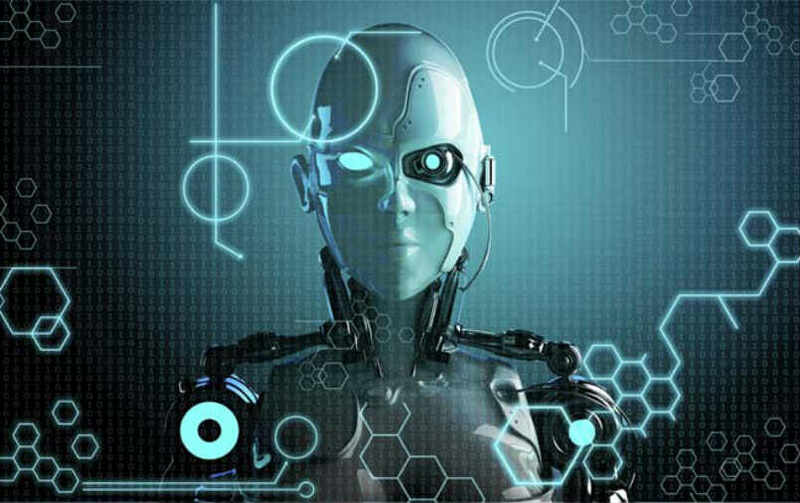 See the robot in the video below, it can not only speak and respond to questions, but it has a “personality” and understands concepts like sarcasm and humor. Researchers at the University of Washington have developed an artificial intelligence software so powerful that it can put words in the mouth of just about anybody. Think about the ramifications of this. A recent, new religion known as "Way Of The Future", worship a 'godhead' based on AI! They state that their focus is on "the realization, acceptance, and worship of a Godhead based on Artificial Intelligence (AI) developed through computer hardware and software." It includes funding research to help create the divine AI itself. I know this sounds absolutely crazy, but this is actually happening. The concept of the Internet was known in scientific circles for many years before it reached the public. Today the Internet and all the technology surrounding it is used everyday by huge numbers of the public. The scientists were working on cloning long before the first sheep was cloned. The same concept holds true with Singularity, that is now taking place. Humans are already being blended with machines, unaware of by the public. They make AI look beneficial these days, for example, who can question an artificial eye for the blind, or a microchip implanted into the brain to help a quadriplegic? However, in the end, the blending of human biology with mechanical technology will very likely be used for evil. Is this far-fetched? Time will tell, for now we can just speculate. Is it possible many of the technologies that Revelation speaks of in regards to the Antichrist are technological deception - such as the image that speaks in Revelation 13:15? I believe that the two beasts of Revelation 13 symbolize our modern science and technology. The first beast symbolizes science, the ORGANized BODY of knowledge, plus all the scientists in the world acting as a team to advance science, plus the scientific team spirit. Science is the beast that is worshiped as an invincible hero by many people, people who scorn all traditional religion as just ignorance, myth and superstition left over from the Dark Ages before the Scientific Revolution and the glorious Enlightenment of science and rationalism. But science has not yet been "given a mouth speaking great things and blasphemies," as described in Rev 13:5. That is yet to come. Then, the second beast of Rev 13 symbolizes our modern technology, which began its rise with the Industrial Revolution. One of the definitions of "technology" is "applied science." So technology acts as the partner and servant of the science beast, in that technology's job is to show many practical applications of scientific knowledge, so that even scientifically ignorant people can see how powerful science is, by seeing all these great signs that technology works in the presence of science. For example, consider the hydrogen bomb (and other thermonuclear) tests by the USA, USSR, Britain and France during the years 1952 to 1963. Note that the H-bomb uses hydrogen fusion, the same type of fire that lights up the sun and other stars in the heavens. So by recreating hydrogen fusion here on earth, men had metaphorically brought the fire of the stars down to earth. The USSR exploded the most powerful H-bomb in history in 1961. Equal in explosive power to 50 million tons of TNT, it was 2500 times more powerful than the first atom bomb tested by the USA in 1945. It was similarly greater than the atom bombs which were dropped on Hiroshima and Nagasaki. Plus it was dropped by a bomber flying at an altitude of about 6 miles. I believe this was the most spectacular fulfillment of Rev 13:13, "it [the 2nd beast] works great signs, even making fire come down from heaven to earth in the sight of men." But the fulfillment of Rev 13:13 actually began when men invented the airplane, and then used airplanes to drop large bombs from high in the heavens. It continued with weapons like the German V2 rocket, which rained fire from heaven down on London in WWII. Note that an exploding H-bomb is a truly spectacular demonstration of the brute power of nuclear physics, or modern physics in general. By this, even people who know nothing of modern physics can see that the physicists' knowledge of atomic nuclei and elementary particles is imbued with monstrous power. It is quite unlike the knowledge of theologians who may argue about how many angels can dance on the head of a pin, but their knowledge has no power at all. If my little theory about Rev 13 is correct, then yes, the talking image of the beast will be an AI (artificial intelligence). And it will be made in the image of all man's scientific knowledge. People will worship and obey it because it has the best scientific answers to all our questions. Also, I believe that this talking image may explain how the science beast "was given a mouth speaking great things and blasphemies" back in Rev 13:5. People will not like this theory, but is it possible Facebook is the software of the beast system? Many are already lulled into the "loving of self" that FB provides. And wether you know it or not FB is guiding and directing it's users constantly. It's always changing and making new rules. Now add your phone into the mix. This is the mark of the beast. It will be offered to implant in your hand and/or head, instantly connecting your mind, soul and DNA to the internet. And if you don't think so, look up "elon musk Nero lace". People are already being hypnotized en masse via Facebook and new smartphone technology. This beast will make an A.I. "body" that will encapsulate this WWW (666) technology that will be able to access ALL internet information which includes EVERYBODY'S FACEBOOK FILES, THAT YOU ALL FREELY UPLOADED AND CREATED YOURSELF. The image of the beast is a robot/cyborg/A.I...internet/demon connection in a humanoid body. The "phone" implant is the mark of beast, and Facebook/internet is the program to tie it all in. We're already giving access to our souls by using these techs, but the time will come where implants will completely change the image GOD made us in, and thereby corrupting the image and nullifying our eternal life with Christ. What if the guy tells the robot, "I'm going to stab you with a knife"?